Beanies would put a smile on their faces ! Decade showed up for the first time on February 16, 2003, at the New York City Toy Fair. 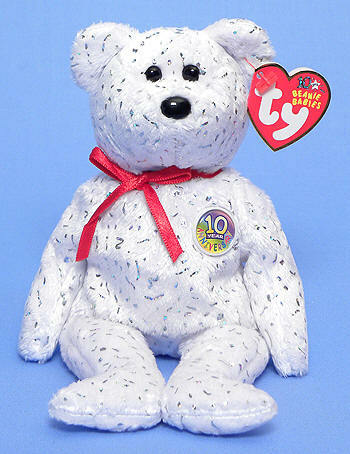 Ty Warner was on hand to personally sign 100 of the Decade bears for retailers. Decade was available in ten different colors during 2003. The colors are brown, dark blue, gold, green, light blue, orange, pink, purple, red and white. Decade (white) wikth no button on its chest.